This unique contemporary condo has an open floor plan with vaulted ceilings. Located just a few blocks from Sherman Ave, the CDA resort and the public beach! Amazing location, no need to drive! Just a short walk to the city beach and park! Also just a few blocks from the Coeur d Alene Resort, shopping, restaurants, gallery's and Tubbs Hill (great hiking and swimming). 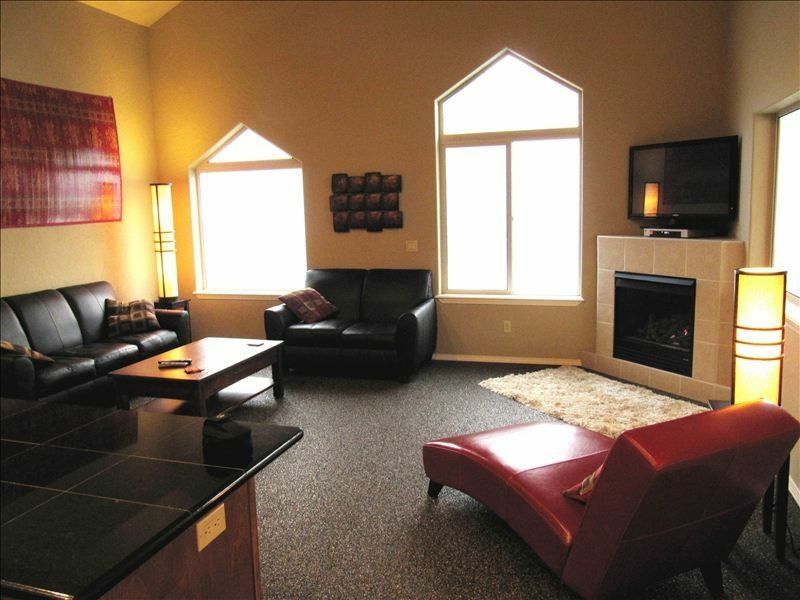 This condo is also located just 17 miles from Silverwood Theme Park and 30 miles from downtown Spokane. Silver Mountain Ski Resort is 31 miles away and 48.3 miles from Schweitzer Ski Resort, some of the best skiing Idaho offers. Artistic designed with a contemporary feel. Spacious and open floor plan including vaulted ceilings. The covered balcony is a great place to eat or just relax. Gated secure entrance with covered carport within the complex. CDA has it all, wonderful nature, fun shopping and great restaurants. The condo is located within walking distance of it all...hard to beat location and the main reason for my purchase. You will enjoy the best of nature close by, and stay in a vibrant beach community. Park the car, you will be able to walk everywhere you want to go! Excellent restaurants, fun shopping and many activities for the kids. The condo situated three blocks away and directly across the famous CDA resort. A5 minute walk puts you at the CDA public beach/park! The condo was great. Very clean and well kept. The kitchen was well equipped. My husband greatly enjoyed the quality of the Keurig:). The location close to downtown was convenient, but at the same time added to the noise level. Not a major issue, but it was noticeable. Ludwig was extremely easy to work with and answered all our questions right away. Would stay again. awesome place!!! couldn't have been any better!!! this condo had everything that you would need! it was immaculate!! Ludwig was very accommodating to whatever we needed! thanks for the great stay in cda! The condo was clean and comfortable. We had everything we needed for our time there. Great location to downtown. We walked everywhere and it was nice to have a dedicated parking space for our car. We had a great time!! Great jumping-off point for exploring Cd’A and north Idaho. Great experience - everything as described. The AC works great, which was needed as temperatures exceeded 100 for a couple days! An earlier review remarked on a lack of DVD player, but there is one now and we used it. Would recommend without hesitation. Great condo for families in perfect location! We loved our stay at this lovely condo! It was well equipped for our family of 4 and was in a great location in downtown CDA, just a short walk to Sherman Street, lots of great food options, and both the main beach park (with huge old playground) and McCuen Park (with splash pad and huge playground). The only thing that would make this place better is a DVD player, but we made do without one :) Highly recommend and hope to return to CDA again! Thank you for the kind words and glad you enjoyed your stay and time in CDA! This place is fully furnished with everything you need to feel as though you are in your own home. Most notably is the fact that you’re within walking distance of all the downtown shops, hiking trails and Lake CdA beaches. We were there during our 30th anniversary. The owners were thoughtful enough to have left a bottle of champagne, flowers, chocolates and a hand written note waiting for us on the counter when we arrived. This personal touch made our stay all the more special. We will try to book this condo again next time we go back to CdA. Thank you Ludwig. This contemporary open spaced condo is located just blocks from the best Coeur d Alene has to offer. A five minute walk puts you right at the public beach/park! Leave the car behind, two blocks from the condo are the best restaurants and shops CDA has to offer. The mains strip, public beach, best restaurants, shops and bike trails are just minutes walking distance away. The condo is located on the second floor (corner unit) within a private and secure gated two story complex.